If you haven’t seen PHISH 3D yet, here’s your chance to win a pair of tickets for the limited engagement that ends this week. As you know, I saw PHISH 3D on April 20th and this week is the only time you can see PHISH 3D during its limited one-week run. 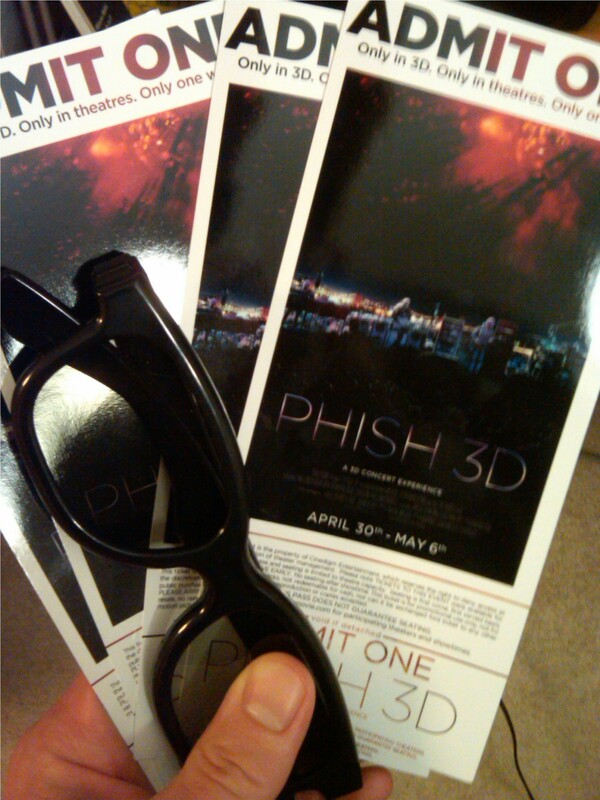 I have two pairs of tickets to giveaway and here’s what you need to do to win them, and a PHISH 3D movie poster. We have a very short time to give the tickets away, so pay close attention to the contest details and make sure you enter your comment quickly. As soon as the contest is over we’ll need to send you the tickets ASAP overnight before May 6th. Two separate winners will receive a pair of PHISH 3D tickets, and a limited edition PHISH 3D poster. Post your response to the question below in the comments section. If you could pick one of your favorite Phish concerts to re-live in 3D, which Phish concert would you pick and why? By submitting your response in the comment section below, you will be eligible for our first ever Live Fix PHISH 3D movie ticket comment contest. UPDATE: Contest End Time Changed To Today Tuesday 5/4 at 6pm CST, the comments will be closed and shortly after I will post a video of me choosing a random number (via this number picker) between 1 and how ever many eligible comments there are. The number that matches the comment (1 being the first comment and so on) is the lucky winner. Then I will award the second pair of tickets by doing a second random drawing using the same random number picker. Repeat responses and/or multiple posts will lead to immediate disqualification (1 answer per user). Winners will email me their address and the tickets will be sent directly to you. Good luck and I look forward to hearing which Phish concert you pick to re-live in 3D! Completely understand my disqualification, but had to put in my 2 cents on this one! I’ve notched around 40 shows by now, and besides Cypress and The Great Went which were memorable in their own right, the shows that stand out for me were those that had some sort of unique theme or ‘flavor’ to them. Sometimes dictated by the venue, sometimes not. This one was for sure; The World Ampitheatre, Tinley Park, August 8, 1997. No, my memory is not that good, thank you Phantasy Tour. Besides the SICK set-list featuring all my favorites; Chalkdust, Wolfman’s, and my personal theme song Cars Trucks Buses, Phish managed to weave a perfect location based (Tinley is a Chicago suburb all you non-locals) Blues theme into the entire 2nd set, leading to an encore featuring a guest appearance by local harmonica player Sugar Blue. I remember specifically watching in awe as Phish wrapped themselves perfectly around Sugar’s harmonica for Hoochie Coochie man. Phish at their chameleon-like best for sure. I’d love to see that in a movie!!! One more thing; and heads out there will understand. You know that point in a jam where you stop dancing, and just stand there with your mouth agape? The jam that is too good even to dance to, where you just want to turn and hug the person next to you because you both witnessed such beauty? Those are few and far between these days, but this show had one of the best; check out the 1st set ending Character Zero. Unbelievable. I’d love to see that again. UIC Pavillion hands down….for Divided Sky alone. Amazing. I have only been to a handful of shows, but If I could re-live one show it would be the 2003 show at the Verizon Wireless Music Center‎ in Noblesville, IN… fun times! hands down, it’s got to be NYE 96! seeing the thousands of balloons fall from the ceiling, for what seemed like forever (i still remember seeing some fall during the encore! ), is an image i certainly won’t ever forget! Thanks to Phish for another memorable NYE blowout! Hmmm…this is a hard one to answer! But, I’m going to go with 12/31/97 at Madison Square Garden since that is one of my most memorable shows.